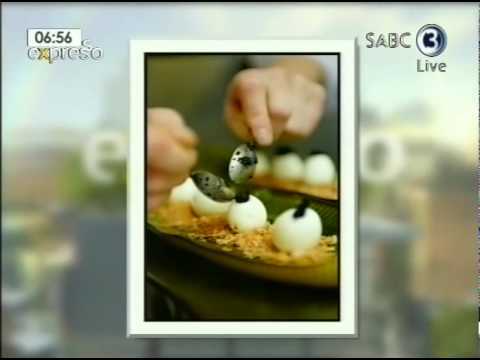 It is no surprise that after chef Marthinus Ferreira trained under the experimental and unconventional British chef, Heston Blumenthal, he would have odd but delicious ideas about food. Ferreira's restaurant DW 11-13 has already received accolades that his former teacher would be proud of. He chose, however, to demonstrate a firm favourite and not a strange delicacy. "What I also learnt under Heston was to bring out the most flavour in each dish that you can. The food may be different, but it is delicious. Take one good ingredient and make it stand out." Beer batter is a simple but delicious way to serve seafood. Prawns, he says, are a quick option and just about everyone loves them. "They're easy to do at home. And the beer batter can be prepared before guests arrive." Start with a 330ml bottle of beer. He uses Windhoek Light, for its dry and bitter flavour but also because it has low alcohol content, especially for those diners who prefer malt flavours rather than an alcoholic, residual flavour. Add half a kilogram of regular cake flour gradually while whisking vigorously to avoid lumps. "Add more flour until it resembles a pancake mix. The batter will be runny but ribbony. The malt gives a great flavour to the sweet prawn meat, and the bubbles and yeast will make the batter puff up beautifully," he says. Add salt and pepper, and a squeeze of lemon to taste. Use deveined and deshelled tiger prawns, but Ferreira advises to "keep the tails on to make dipping easy and for presentation". Holding the prawn at the tail, dip quickly into the batter until the prawn is coated. Then dip into deep, hot sunflower oil. "Hold onto the tail until the batter takes shape." Fry until golden brown, no more than a few minutes depending on the size of the prawn. Ferreira serves the prawns with a sweet chilli puree. Avo puree or marinated aubergines also make good accompaniments. No. This fine restaurant is not named after a cryptic code for a magical additive – though many believe it does stand for a secret ingredient in the fare. The post-modernist moniker of one of the top restaurants in South Africa has a more simple origin – it is shorthand for the address (11–13) at Dunkeld West (DW), an upmarket mall in the suburbs. The sublime simplicity of the fare has put this overnight culinary hot-spot on the map like a GPS landmark. The minimalist décor of the chic bistro, in lime-green tones, creates a sleek metropolitan ambience from the elegant cocktail lounge and bar to the dining zone with its banquettes in the comfort zone. The spotlight is on the perfectly plated food of award-winning chef Marthinus Ferreira, who transforms South African ingredients on a global, contemporary plate. He honed his skills in the kitchens of Heston Blumenthal, Gordon Ramsay, and Dominic Chapman. Back at his own restaurant in his native South Africa, Ferreira focuses on local, seasonal ingredients – enhancing the natural tastes and textures of South African seafood, meat, and produce with his own brand of culinary wizardry. For starters, try pan-fried scallops in hazelnut vinaigrette – or beer-battered prawns. Food critics often quip, “Never trust a skinny chef.” Well, you don’t have to worry about that around here. The big, bold chef cooks with dollops of passion, creating hearty dishes with intense combinations of flavour – and a twist in the tail that bears his signature in brilliant garnishes, sauces, and stocks. His signature dishes on a refreshingly simple bistro menu are inspired by the classics – curry-cured salmon; roast rack of lamb with caramelised tomato jus; or roasted quail with raspberry jus. His exquisitely plated fare is deceptively simple – bringing fine dining into the comfort zone. In an age when many chefs focus on the complexity of dishes and showy technique, Ferreira makes his mark by paying great attention to detail. He goes back to the basics – creating classic combinations such as slow-roasted farm chicken with truffled mash and well-aged rib-eye steak with Bordelaise bone marrow sauce. And he says he does use secret ingredients – star anise, and butter, butter…and more butter! Pride, passion, and perfection are the three mantras of Marthinus Ferreira, chef-patron of DW Eleven-13. Ferreira has worked in the United Kingdom in the Michelin-starred kitchens of Heston Blumenthal at The Fat Duck, and Gordon Ramsay’s Riverside Brasserie. He names Franck Dangereux – formerly of La Colombe (rated 12th in the World’s 50 Best Restaurants 2010) in Cape Town – and Dominic Chapman at The Royal Oak as mentors. He defines his food as “simple, modern European with South African flair.” For inspiration, he says he looks to market ingredients – to make a Jerusalem artichoke soup when in season – and goes through his cookbooks regularly to create new dishes. Hmmm . . . I’ve been trying to think about what struck such a cord with me in this place. It’s round the back of (lets be fair) the rather old and weathered Dunkeld Centre. I mean the centre is almost a landmark of JHB by now and probably only second to the Takkie Centre inside it. Unfortunately for the restaurant I think this is its biggest detracting feature. While I did go for a lunch rather than the usual dinner, the fact that its on the back of a parking lot (if you sit outside) really does distract from the simplistic magnificence of this place! Once you get past that though it’s really a magical treat! The decor is simple yet modern, with perfect touches of elegance that carry through to the people and even the food. So let’s get into it! Chow – I have only felt this way in a handful of restaurants around the world! They range from Michelin star restaurants, to a small Sushi bar in Barcelona, to the back streets of Rome, to some touches of brilliance in Stellenbosch and Paarl. The point I’m trying to make is the status of the restaurant isn’t important – the quality of ingredients & their combination, presentation and most importantly the fact that the dish feels like it was prepared specifically for you rather than churned out of a kitchen en-mass – that is the real secret! To start I had the steak tartar which I try eat in every restaurant I go to. This ranks as, if not the best, certainly in the top two that I can recall (top three actually but the third was at 4am in Paris after the Boks had just won the world cup and thats just not fair). Following this I had a flawlessly cooked (and I like it bleu so it’s generally never perfectly cooked), richly decadent steak and chips (don’t be fooled by the simplicity of the name and rather read the salivating explanation) which was sensational! These two dishes with the great Springfield Wild Yeast (not the best combination for my meal – but it was for the other meals and it really is delicious) just rounded off a perfect Saturday lunch in Joburg! Ambiance – I think I have covered this in the preamble. I just had to get it out because besides that this place was really a hidden gem (like something that by mistake got dropped by the restaurant gods on JHB rather than Franschoek). Service – The service was friendly, in the correct dosage and always with a smile which in this case was refreshing rather than annoying. Perhaps when it came to food and wine choices I would have like a bit more explanation or knowledge (this may only be because it was lunchtime and therefore the dining ‘pomp and circumstance’ is diluted somewhat). Cost – Again I must confirm that this has nothing to do with the actual pricing but rather the value for money of the meal (and probably the experience as well). In this instance I was blown away by the cost of the meal. I have eaten at average family style restaurants for the same price as this exceptionally talented man is selling some of Joburg’s (and probably the country’s) greatest dishes. This is without doubt one of the greatest value for money restaurants I think Ive had the pleasure of eating at anywhere in the world and it has inspired me to stop being so nice about mediocre restaurants and start critiquing properly! Had this been the only lesson I learned it would have been well worth it but then I wouldn’t have been allowed to continue to share this tremendous experience with all who will listen! This little gem of a restaurant is the Dunkeld suburb’s secret. The word “tucked away” gets bandied around like a kitkah in my mother’s house on a Friday night. The phrase is used to create a romantic setting, but only after my visit to DW eleven-13 do I really get it. Hiding in the Dunkeld Shopping Centre behind a fruit and flower shop is a sophisticated but comfortable restaurant. Unless you find it by accident or by word of mouth, you’re unlikely to come across this little gem. It’s the suburb’s secret and it fills up fast even though it’s Wednesday. Now it’s time to tuck in. To start, the Alaskan crab cocktail topped with corn sorbet. I get nervous when I see crab on the menu; and not because its unkosher – yes, bad Jewish girl. It’s just that squeaky-fake crab sticks are enough to put me off. But this was the real deal and the starter was superb. The crab was firm and fresh in creamy avocado, mixed with fresh cos lettuce, tomatoes and chives. The corn sorbet with a hint of cayenne pepper was refreshing but also sweet and overpowering with the crab; but yet nonetheless a delicious combination. The braised lamb shoulder was excellent. Succulent and tender, it was served with potatoes and a honey parsnip puree. I enjoyed the different textures in this meal from the soft meat, to the crunchy potatoes and smooth puree. This is probably the second-best lamb dish I have eaten to date – the best being my mother’s of course. For dessert – a lemon soufflé with lemon sherbert and berry coulis. This one is for the sweet tooth type. Though very sweet, the lemon soufflé was light, fluffy and refreshing and was a perfect ending to this fantastic meal. A wonderful experience with friendly and efficient service, top ingredients and a creative chef will have me return again for more. Ferreira says that it’s great to win this type of award as it helps with marketing, which brings more people to the restaurant. His food is creative with attention to detail and I highly recommend you to try DW out. From my meal at DW I realise that our local culinary landscape is dotted with talent. The restaurant will be running a special menu for Valentines Day, as well as their usual a la carte menu. Ferreira says that depending how he feels on the night, he may create a few special treats as well.